Sela Kasepa first heard about the Pan-African Robotics Challenge while channel surfing in her living room in Kitwe, Zambia. The program enthralled her. 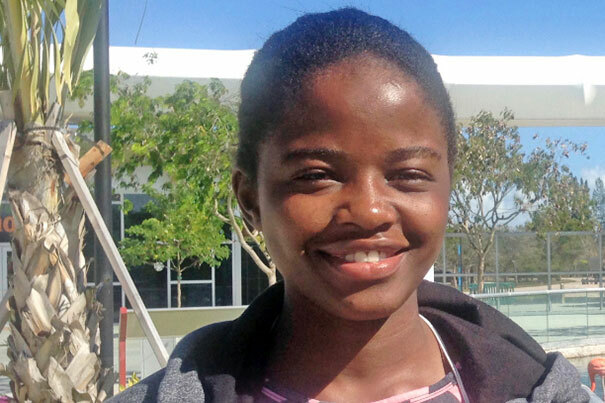 Kasepa thought a robotics competition could inspire her fellow Zambians to take an interest in STEM (science, technology, engineering, and mathematics) subjects, fueling technical advancement in the developing Central African nation. Fast-forward a few years and Kasepa was a Harvard freshman taking “Computer-Aided Machine Design” (ES 51) at the John A. Paulson School of Engineering and Applied Sciences when that fascination was rekindled. Watching the robot she built maneuver around a competition course, she felt empowered. Kasepa began looking for a robotics competition Zambian youth could join, and found FIRST Global, an annual student robotics Olympiad founded by inventor and entrepreneur Dean Kamen. Zambia was not among the 162 countries participating, so she asked about future contests. Organizers urged her to launch a team for 2017, even though other nations had already begun raising money and training students. Kasepa called her mentor, Peter Lungu, director of the Zambian Institute for Sustainable Development (ZISD), a nongovernmental educational outreach organization that had awarded her a scholarship, setting her on a path toward Harvard. Lungu agreed to help recruit students and mentor the team in Zambia, since Kasepa was now deep into her college coursework. They enlisted seven students, set up a robotics shop at ZISD headquarters, and ordered the FIRST Robotics kit of materials to build the machine and basic construction guides. The competition theme was clean drinking water, and robots were designed to collect and sort color-coded bowls signifying clean and contaminated water. Kasepa coached the team via Skype and recorded demos of fabrication techniques on YouTube. Passionate and dedicated, the students worked from sunrise to sunset as they caught up with their international competitors. Kasepa’s long-distance encouragement boosted team members when they hit roadblocks, like when parts broke and they lost valuable time waiting for replacements to pass through customs. But as the robot came together, a new worry emerged — how to fund the journey from Zambia to the international competition in Washington, D.C., in July. Kasepa began making cold calls, but couldn’t get a response. Then she shared her frustrations during a casual conversation with Evelyn Hu, the Tarr-Coyne Professor of Applied Physics and Electrical Engineering. Hu offered to help, and secured a grant from the Office of the Vice Provost for Research that would cover travel expenses for the three team members required to qualify. Using Lungu’s contacts at an Ethiopian airline, they negotiated sharply discounted airfare and were able to pay for all seven teammates to attend. Kasepa was elated, but lacking funding for her own travel, she would have to watch the competition streamed live online. The first match ended early for the Zambian team; one of the robot’s chains was displaced and they were unable to fix it before time ran out. Devastated, the students worked into the night making repairs. On the second and final day of competition, Kasepa tuned in, leaning close to the computer screen as the day’s frenzied contests began. The Zambian robot ran seamlessly. When the dust settled, her team had earned 32nd place out of 163 national teams. Kasepa, who also organized a robotics showcase for Zambian children during a school holiday, wants the country’s participation in FIRST Global to continue. She hopes that with the support of mentors and the excitement of the young students who saw their country compete on a global stage, they will be able to sustain the program.